The impetus for this work has been part of an ongoing struggle. A struggle that has been uniquely mine yet paradoxically experienced by each of us at various points throughout life. From the earliest stages of human development, each of us learns about self through the experience of contrast between us and that which is other. A baby begins to comprehend the difference between self and mother through the contrasts created by the touch. sight, and sound of its mother versus that of its own. Later in life, we often learn to distinguish who we are through the experience of contrast between the ways others (friends, parents, classmates…) are like us or different from us. This process of self-discovery continues throughout the life cycle because each of us is always changing. The person you were at 3 is still present within your DNA and consciousness but is definitely not the same person who is reading this post right now. This process of continual growth and deepening consciousness requires that we not only discover who we are in terms of likes and preferences but also necessitates that we come to know self with depth and profundity. In a sense, one could postulate that we don’t actually learn who we truly are, but rather that we find the courage and strength to discover, and then become who we truly are. That living a conscious life is a continual process of becoming or embodying the spiritual beings whom we truly are. As our eternal being, our essence becomes more fully integrated and embodied within us it shines forth more brightly through us under the guise of personality. In order for this to occur, we must first find the willingness to look within, the strength to face what we find there, and finally the courage to be that person in the world regardless of what others may say or think about us because of it. This kind of courage requires that we commit ourselves to complete truth and authenticity in all of our interactions. That you find the courage and commitment to be and do YOU in every aspect of your life – no matter what the circumstances. No facades, no compromises to get along, no hiding how you really feel or think to fit in, no holding back your truth for another’s sake…etc. I’m talking about having the courage and determination to be who you are in every way you can, under any and all circumstances. Each of us has the right and the responsibility, to be who we are and do what we want as long as we are honest and forthright in our intentions, and do not hurt or harm others in the process. This kind of freedom can only be achieved by operating from a level of truth and authenticity that most of us are not willing to live from. In my opinion, this is the kind of commitment to truth and authenticity which lies at the core of 5th chakra symbolism. The 5th chakra’s core principle is truth. It is the first chakra to move us beyond the boundaries of our physicality and connect us to the higher realms of consciousness by acting as a conduit for the expression of vibration, sound, and speech. Thus it is associated with the throat, neck thyroid, shoulders, arms, and hands. When we deny the truth within ourselves, or continually speak or act in ways which lack integrity or truth this chakra can easily become clogged or choked thereby weakening its’ vibration. When fully opened, this chakra gives one the courage and commitment to express one’s self in truth and authenticity. This has been the focus of my struggle. To not only know, “Who I am” but to strive to authentically “be me” in all situations and circumstances. To stop worrying about, “how others view me or my art?” If speaking my truth will cost me friends or prestige? Will people not like me if I show them who I really am or what I’m about? To be true to self is the simplest yet most difficult of endeavors. This year I am determined to open and clear this chakra. To let the real me shine forth and open up like as a flower opens to the receive the rays of the morning sun! To open to my truth, and express that authenticity in all my interactions. This is the Flowering of Truth. The flower upon which the figure sits is also a lotus. I purposely used the varying shades of blue for this composition since the primary colors associated with the chakra are cerulean blue and turquoise. This flowering lotus is opening because the figure seated upon it is chanting the seed sound “Ham” as a mantra as she meditates upon the qualities associated with the 5th chakra. Since the seated figure is meditating upon the 5th chakra and chanting its’ seed sound, I chose the lift her head and expose her neck – the primary body part associated with the 5th chakra. I intentionally placed the tale end of the seed symbol in the lotus above her head near the figure’s throat in order to further accentuate her neckline and the connection between sound/mantra, the symbol, and the chakra’s connection to the throat. 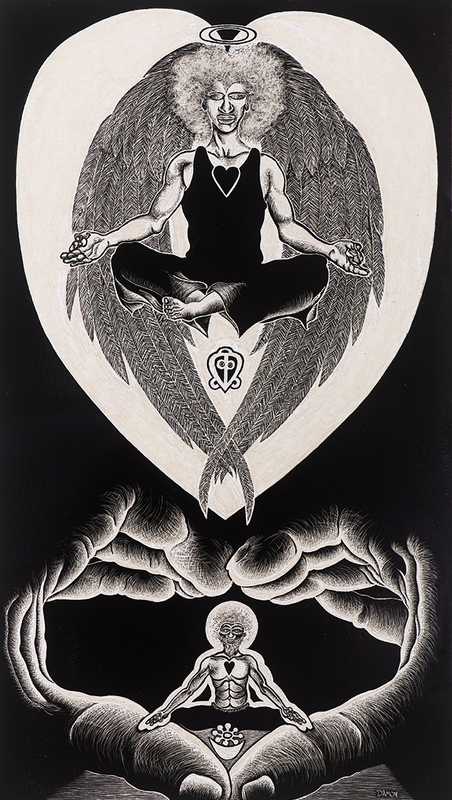 My intention was to strike a balance between the areas that were more highly rendered (the opening lotus and the figure’s flesh) and the more graphic areas (the lotus above the figure and the figure’s clothing in order to create a visually energetic push-and-pull between the various portions of the composition. This tension helps to create a downward movement which draws the eye from the face down through the opening lotus. I chose to keep the background soft and muted so that it would not distract from the main focal point of the composition – the meditating figure. I know its been 4 months since you heard from me, but you haven’t been forgotten. I’ve been pressing on, but there hasn’t been much creating. My last post in July was part of my normal summer slowdown, but unforeseen circumstances burst onto the scene commanding a large portion of my time and attention. The darker sides of life and people often present themselves to us at unexpected times in unexpected ways. So I was reminded that into each life, some rain must fall. All of life is a revolving series of endings and beginnings – the sun rises and sets, the seasons transform and change, joys bring us light and sorrows bring the blues. The people and things we love most are very often the sources of our brightest days and darkest nights. The winds of change blew a storm my way and I got the blues. People say that time heals all wounds, but what we do between the hurt and the healing can make a world of difference. It’s not just the time, but what we do during the time which determines whether we heal in a manner which is conducive to future growth, or just an exercise in repression which eventually leaves us with more psycho-spiritual baggage. These unseen scars cause more damage and heal much slower than our physical bodies, so we must be more intentional about our healing by doing so from the inside out just as our bodies do. Every day, everyday I have the blues. Speakin’ bout hard times and trouble, you know I’ve had my share. The term enlightenment is derived from the notion of light. The light of consciousness, the light of knowledge, the light of awareness that breaks through to us, and in us. Light comes to us in the midst of our ignorance, blindness, our will to power, and our pain. As we receive that light we slowly but surely ascend. We accelerate the process when we consciously and deliberately choose to consistently go within. These epiphanal glimpses of light inspired Ascension II. As I reflect upon it now, the creation of Ascension II was almost inevitable. The thoughts and feelings which led to its creation are evidence of the natural process of expansion and deeper consciousness that accompanies the path to enlightenment. The Buddha is not necessarily a person. A more accurate characterization would be to identify it as a state of being, or conscious awareness that can be reached by anyone. This truth ensures that there have been, and will be many Buddhas throughout the course of history. The Buddha is a nature which one acquires as one seeks to go ever deeper within. It is believed that some who have reached this state were able to literally shift their vibration to such a high rate that they disappeared into the realms of higher consciousness. One of the first things you will notice about this piece is the horizontal format. I intentionally chose to use this format because I wanted to emphasize the point I made in my discussion of Ascension I regarding enlightenment as a process of expansion and not the upward movement we so often assign to it. Just as the first piece was long and vertical, this piece is wide and horizontal (36h x 48w) to reflect the notion of expansion as both upward and outward movement. The four figures located in the corners of the image are seated in various meditation poses. They represent adepts who are following the teachings of the Buddha, and the Four Noble Truths of the Buddhist tradition (suffering, craving, there is an end to suffering, follow the path). Each figure is surrounded by an auric field which is not complete because they have not yet achieved enlightenment but are still walking the path. The Buddha is encompassed within an eight-rung wheel which is reminiscent of the eight-fold path that is followed by all who seek to ascend in this tradition. The Path is characterized by the concepts of: right understanding, right thought, right speech, right action, right livelihood, right effort, mindfulness, and singularity of mind (enlightenment). It is the possession of these virtues which leads one toward ascension. The deep purple which comprises the wheel and the four figures is indicative spiritual strength-an essential for any transformation. The Bodhi tree at the bottom center of the composition is a historical reminder that it was during meditation under a such a tree that Siddhartha achieved his enlightenment and thus ascended into the realms of Nirvana. My use of the star-shaped figure around the wheel symbolizes both light, and the sudden flash of spiritual insight which can often accompany periods of deep meditation. One is often privy to sudden flashes of understanding which lead to even deeper levels of inner light and spaciousness. In the center of the composition, we find the Buddha himself. He is sitting in a full lotus position with his eyes closed in deep meditation. He levitates above and within the spiritual energies which surround him. I wasn’t really interested in representing the chakras in this image. My main concern was to depict spiritual light and create a sense of vibration and spiritual power. The lighter pastel colors which form the auric field, are not necessarily based upon the chakras. All of the colors used in this piece were carefully chosen after numerous color roughs to determine which tones would work together seamlessly. It may seem random but the placement of the colors was carefully worked out so that they would all work together and compliment one another. Many pastel colors can be symbolic of higher energies without necessarily referring to the chakras. From a frequency perspective the many of the colors we associate with cooler temperatures (blue, green, violet) are actually of a higher wavelength frequency than those we think of as warm (red, orange, yellow).The magenta cloud is juxtaposed to the deep blue clouds in an interplay of light and dark. The deep blue representing spiritual darkness or the unexamined state while the higher vibrations of magenta and the rays of green and yellow light break through the darkness. Inspiration is a funny thing. It is often born from the most unlikely sources and flashes into consciousness at the worst possible moments. Yet these capricious insights are an integral part of the creative process. To be inspired is to be “in Spirit” and that was exactly how the seeds of this image began to sprout. Over the course of 3 weeks, I had been listening to several talks by various thinkers and intuitives on the topic enlightenment and the expansion of consciousness. The more I absorbed their perspectives and meditated upon the topic the more insights poured into my mind and spirit. Over those weeks, I felt a growing need to not only synthesize these insights but to share them with others. As human beings, we often think of ascension as an upward, and often hierarchical movement, but in reality, ascension is circular and holistic. Ascension is about expansion! The expansion and integration of one’s consciousness throughout all levels of self. Thus, one becomes fully self-actualized and self-aware physically, mentally, spiritually, and energetically. From this perspective, one can only ascend outward and upward to the level or depth one has also gone downward and inward. This can be evidenced not only in Jesus’ life and ministry but in the writings and biographies of all the spiritual masters. We see what can best be described as a kind of implosion. Each master first begins by going within in an effort to know the self’s inner world and locate that quiet, silent place of inner spaciousness. But in each instance, the master begins to discover that the journey within is simultaneously connecting her/him more deeply to all that is without and beyond. Paradoxically, each one discovered that the universal resides within the particular. Yet each reached a point upon the inward journey where there was no further they could go. The journey inward was then replaced by an opening, a flowering, or a rapid outward expansion which completely altered their way of being. This transformation occurs as a result of the inward exploration and is directly linked to the act that we refer to as ascension. I chose Jesus because he is the most easily recognizable figure within my particular context. Since Jesus’ ascension is directly linked to his death and resurrection, I felt it was extremely important to make reference to these events within the work so that one can see the continuity between them. I began researching Jesus and the ascension using various theological texts and the biblical narratives. The main features of the biblical narratives are Jesus ascending up into the heavens, the presence of heavenly beings, the elements, and the disciples who stand in witness. The image is painted using acrylic paints on a large solid wood board. I actually found the piece of board lying outside near a trash pick-up site. I was walking down the street and noticed this large piece of wood supported by a couple of trash bins. The wood’s surface was distressed by scrapes, peeling layers, and various rippling textures. Normally I wouldn’t even have paid attention to something like this but the surface was so intriguing that I decided to take it to my studio. It literally sat in my studio for a month and some days I would just sit in the studio and stare at it. I felt a connection to it in some way but I had no idea what to do with it? It wasn’t until I was halfway through my sketches for Ascension that I understood why I had been drawn to this block of wood. The panel is 1.5 inches thick and weighs about 80lbs. Its surface is rough, pitted, and unfinished. This large piece of wood is reminiscent of the Jesus’ death on the cross. Its surface and texture are not only symbolic of a cross but it is earthy and grounding just as Jesus’ death truly was. It reminds me that life, death, and ascension are not heavenly conceptualizations to be spiritualized, but real-world, natural, embodied experiences that are played out within the earthly realm. The two angels found on the upper right and left portions of the composition are representative of heavenly witnesses and guides. The angel on the left holds an ankh which symbolizes rebirth and new life. The angel on the right wields a spear which makes reference to Jesus’ death by human hands and the piercing of his side by the Roman centurion’s spear during his crucifixion. The elements of cloud and sky have always held a prominent place in spiritual symbolism. The clouds symbolize both the divine presence and the biblical narratives’ description of Jesus ascending up into the clouds as he entered the heavenly realms. In the biblical tradition, the divine presence is often symbolized by clouds so I felt they were appropriate for this image. The golden-yellow sky is symbolic of light and spiritual illumination. The divine light pours forth bringing both physical and spiritual illumination to Jesus and the disciples who see and comprehend the events with supra-natural clarity. The symbol floating in the sky above Jesus’ head is the West African Adinkra symbol for transformation. The silhouetted figures found in the bottom portion of the composition represent the disciples who not only witness the ascension but later receive a portion of Jesus anointing and divine power with the arrival of the Holy Spirit as it is described within the biblical book of Acts. These figures are in various positions of prayer and supplication as they worship their ascending master. Each figure is not only connected to the next, but each is connected to Jesus through the orange mandorla which surrounds Jesus who is ascending up above them. The deep blue depicts the figure’s silhouettes since they are surrounded by the dark clouds of divine presence. They are also encircled by red and orange halos (respectively). The former represents Jesus’ shed blood which covers the figures and provides both protection and connection with the divine presence. The orange halo is symbolic of the disciples sharing in the same spiritual power that Jesus himself possesses. Jesus is depicted within the very center of the composition floating upon a cloud as he ascends into the heavenly realms. The viewer’s eye is directed to this focal point by the use of an orange mandorla surrounding Jesus. The same orange also surrounds his actual figure as an aura. Orange is an expansive color that is often used to symbolize energy and power. Since ascension is expansion I thought the orange was an appropriate means of symbolizing this reality. In addition, the biblical narrative clearly connects Jesus’ ascension with the notion of power, both spiritually and physically (“All power in heaven and on earth has been given to me…”). This power pours forth from the figures’ eyes and body (if the eyes scare you stop watching so many horror films). The symbol that accompanies this new state of ascended transformation is the reiki symbol for enlightenment emblazoned upon his forehead in red. The red robe is reminiscent of Jesus’ death and the blood he shed upon the cross. His sacrifice will be the catalyst through which those who follow him will gain access to the heavenly realms. His hands are outspread in a gesture of welcome as his forefingers grasp his thumbs to form a mudra.